I had a jam-packed couple of days! 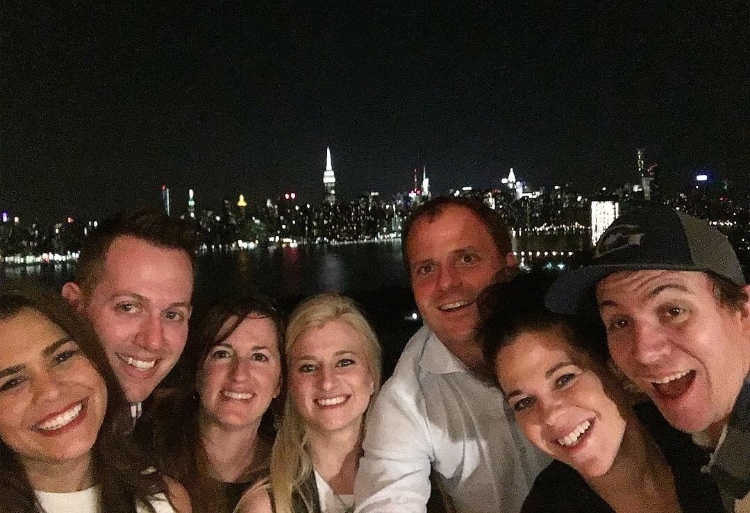 I only had one night in NYC, so I wanted to make the most of it. I bought a plane ticket for Jerry to come with me, and we arrived in the city at 8:00 on Monday morning. 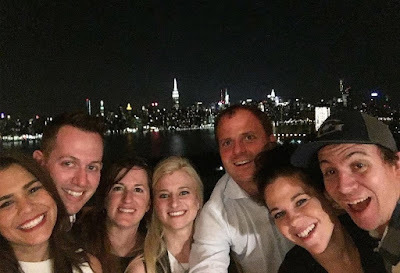 We took the subway to Brooklyn, which is where our hotel was. I wanted to just sit on the balcony all day, but of course we decided to go explore the city. Jerry and I went to Manhattan to meet up with our friend Mike, and then had lunch with him. We walked all over the place, and bought each of the kids a souvenir, then went back to the hotel for a welcome reception that Purina was hosting on the terrace. 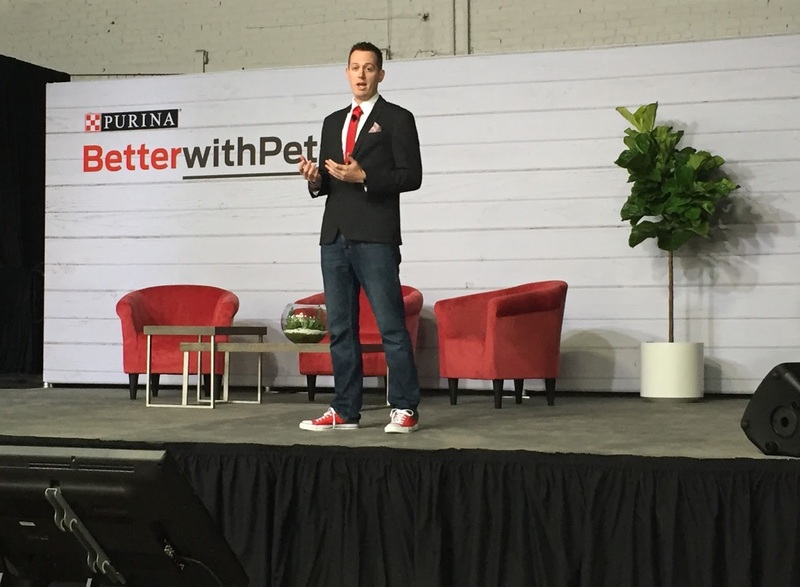 I saw some familiar faces of people that I look forward to seeing at each Purina event, and I met several new people as well. Jerry and I ended up going to bed that night at around 11:30, even though we wanted to stay up longer with everyone. We'd gotten up at 3:00 AM for our flight that morning, so we were exhausted! Yesterday was the main event, the Purina Better With Pets Summit, at the Brooklyn Expo Center. I've written about this event before, because I attended in 2014 and 2015. It was the 2014 Summit that made me want to adopt a dog, and we got Joey a few months later. Better With Pets involves several people (some experts, some ordinary pet owners) giving presentations, all with the common theme of how and why our lives are better with pets involved. Several of the influencers bring their pets to the Summit, and getting to see all the dogs and cats is probably my favorite part! My pets would never sit that still for a photo! I was SO excited to see a glass room just waiting to be occupied, because I knew that in a little while, they'd be putting puppies and kittens in there! We would be able to go inside for "puppy and kitten therapy" ;) (The pets were adoptable; and thankfully, I don't live nearby, because I may have gone home with another pet). I should've taken a photo once the pets were inside, but I was too busy holding kitties! but she was SO curious and energetic. Anyway, there were a few panels throughout the day, as well as a couple other presentations. My favorite presentation was about the Purina Family Pet Center at St. Louis Children's Hospital. I think it's pretty well known that pets can help with depression and loneliness, so having a pet is great therapy. However, there are very strict rules about having pets in hospitals, so when kids have a long term stay in the children's hospital, they aren't able to see their pets. Flip Becker, the Senior Director for Corporate and Foundations at St. Louis Children's Hospital Foundation, thought it would be ideal if they had a special room where patients could go (with doctor's permission) to have a visitation with their own pets from home. The funding just wasn't there, so he approached Purina about it, and Purina gifted the Pet Center that is now at St. Louis Children's Hospital. Flip shared a few stories of kids who were able to be reunited with their pets after being in the hospital for so long (one little girl hadn't seen her dog in over a year!). There was one boy who was not very communicative and he spent all his time in his room. Once he was able to visit with his dog, his mood changed for the better, and he began communicating more and showed more energy. These are just a couple of examples of how our lives can truly be "better with pets"! Another story that really touched my heart was from a woman named Roben Harris. She has a daughter with Spina Bifida, and her daughter has had 28 surgeries, so she has spent significant time at St. Louis Children's Hospital. Roben and her husband had three kids, and then decided that they wanted to open their home to foster children. With just two hours notice, she took in three abused and neglected siblings, and ended up adopting them, turning her family of five into a family of eight! Here's where pets come in: to show her adopted children just how a "forever home" works, they adopted a dog. She explained that this was the dog's forever home, no matter what--he may pee on the rug, or chew up furniture, but regardless of what he may do, they would never send him away. And she said it was the same for the kids--they were in their forever home, no matter what they may do or say, they were going to stay and be loved and cared for. Isn't that an amazing way to show unconditional love? I can't even tell you how many times I teared up while she shared that story. What an amazing woman. Nathaniel Fields, president and CEO of the Urban Resource Institute (URI), one of the largest domestic violence shelters in NY, gave a moving presentation as well. He said that 48% of domestic violence victims stay in abusive situations because they don't want to leave their pets behind. They fear that their abusers will then abuse the animals, and the victim won't be around to protect the animal. URI launched URI-PALS--People and Animals Living Safely--making it the first co-sheltering program in NYC, and one of only a few across the U.S. Their goal is to keep families safe together, which includes the pets. Such a great program! After the panel discussion, all of the attendees put together boxes of goodies for URI-PALS. After assembling the boxes, we filled them with blankets, t-shirts, food/water bowls, collars, and food. All of the boxes will be donated to the URI-PALS program. Finally, something that was announced yesterday that I'm very excited about is that Purina is teaming up with Mayo Clinic for a study that will measure the benefits of animal-assisted therapy as a way to reduce pain and depression while improving quality of life in patients with fibromyalgia. This makes me excited because a very good friend of mine has fibromyalgia, and I have seen firsthand just what that can do to a person (mentally and physically). Coincidentally, my friend just adopted the sweetest dog for the very purpose that Mayo Clinic is studying, so I'm eager to see the results of the study. I learned so many things and heard so many great stories that it would be impossible to fit it all in, but these were my favorite/most memorable. As always, I came home feeling inspired (I will not be adopting another pet any time soon, however! haha) If your pet inspires you to "live big", feel free to share on social media using hashtag #LetsLiveBig! I know that my doggy is a total therapy dog. My hubby has had battles with anxiety stemming from a health scare and my doggie could just sense when he was in a panic! Puppy snuggles are definitely a cure for that! That's great about your dog! My cat, Phoebe, does the same thing. Reading about the stories with the kids and their pets just gave me goosebumps! Thanks for sharing! That's really wonderful about the pet room at the hospital!! How special for those kids to get to see their pets! I need a puppy and kitten room!